Old canes removed and ready for fresh new ones come spring! There comes a time when a rose cane is exhausted of energy and needs to come out. You can usually tell by their appearance. They are heavily wooded over, no longer producing new growth and blooms. The rose plant will replace this cane on its own but it needs your help. It needs you to “take out the old to make room for the new”. Taking this old cane out at the base of the plant spurs the rose to produce fresh, new canes full of vigor and ready to flower. 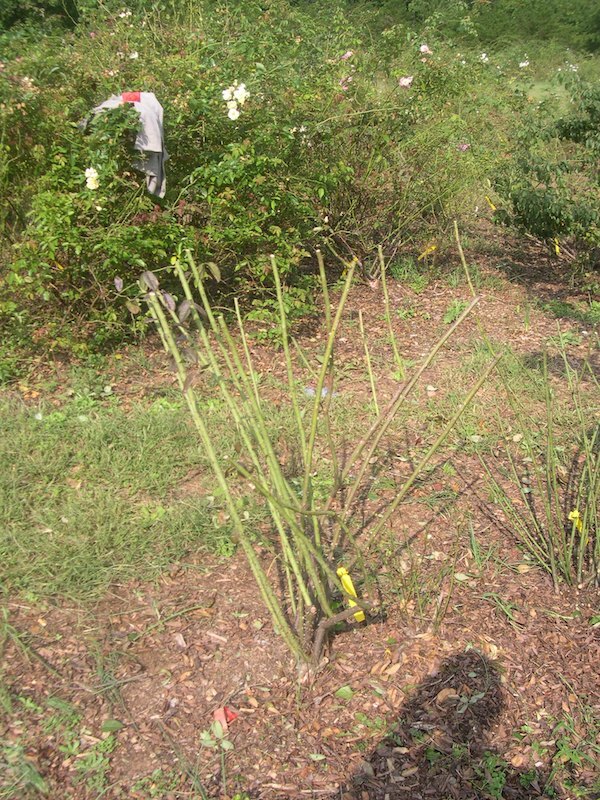 Taking out old canes rejuvenates the rose plant. Let me tell you right up front the first time you do this its pretty frightening. You feel like you are taking out a big chunk of the plant and all you will be left with is a huge hole in that will never be filled. Trust me when I say it will. For every old cane I take out I generally get 2-3 new ones to grow in its place. So take that first step and you’ll be amazed at how much better the rose will look come spring! Take the cane out at ground level. Don’t try to leave a few bud eyes above the ground. The best time to do this is during pruning time. There is no hard fast rule about doing this every year. Let the cane tell you when it’s time to come out. When it appears tired and worn out it needs to come out. Here is a video to show you what we’re talking about.